This is a 3-night, 4-day workshop. 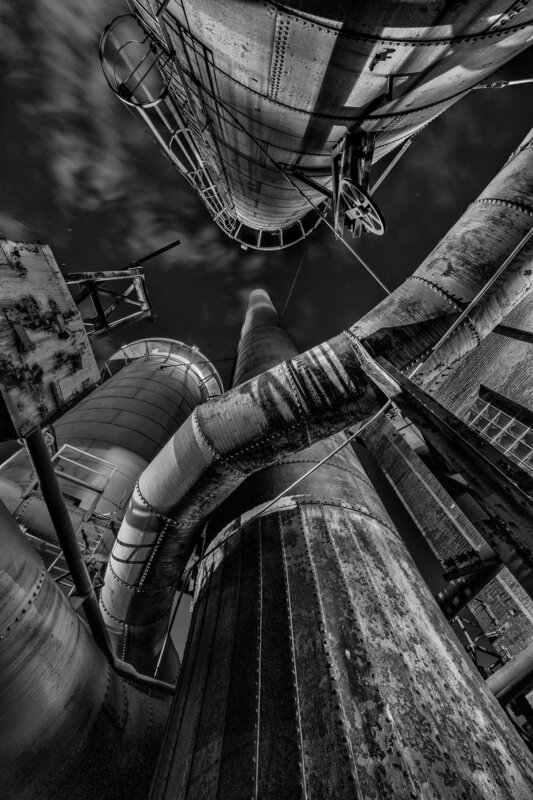 Your adventure begins at 10 a.m. on November 15 and ends after a public final slideshow at the Sloss Furnaces in the late afternoon of November 18. We recommend arriving in Birmingham on November 14 and leaving on November 19. $1295 + applicable taxes. Apply below. Note: Deposit of $500 is required to reserve your spot at the workshop. Balance of $795 due on August 17, 2018. Or, you may choose the "Pay in full" ticket if you desire to pay all at once. Last day for a cancellation request is August 16 (see details here). The workshop fee does not include transportation to and from the shoot locations, lodging, food or the park admission fee. Sold out. Consider joining our Waitlist below, or check out our other workshops for 2018. We are always searching for new places to explore and to offer our workshops. 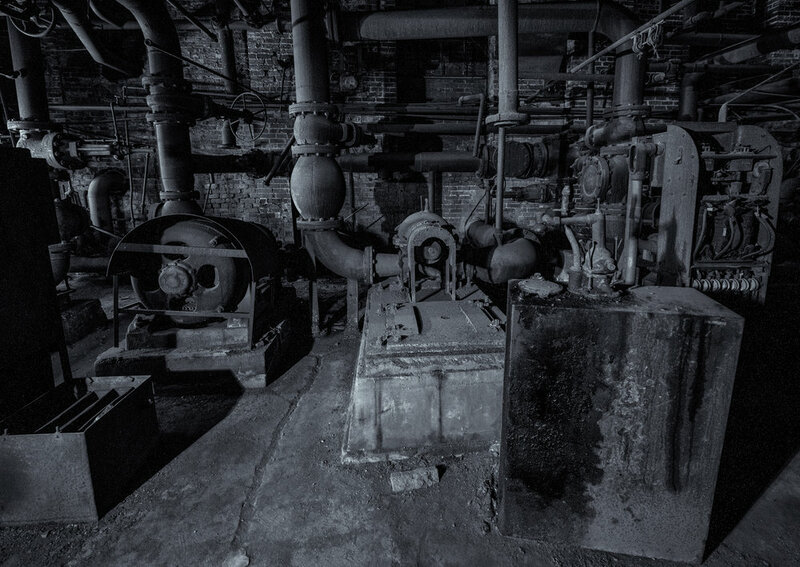 We may one day explore Sloss Furnaces again, but we're likely to visit a lot more parks and places before then. If you have a dream of making epic long exposures here, we hope you join us in 2018. 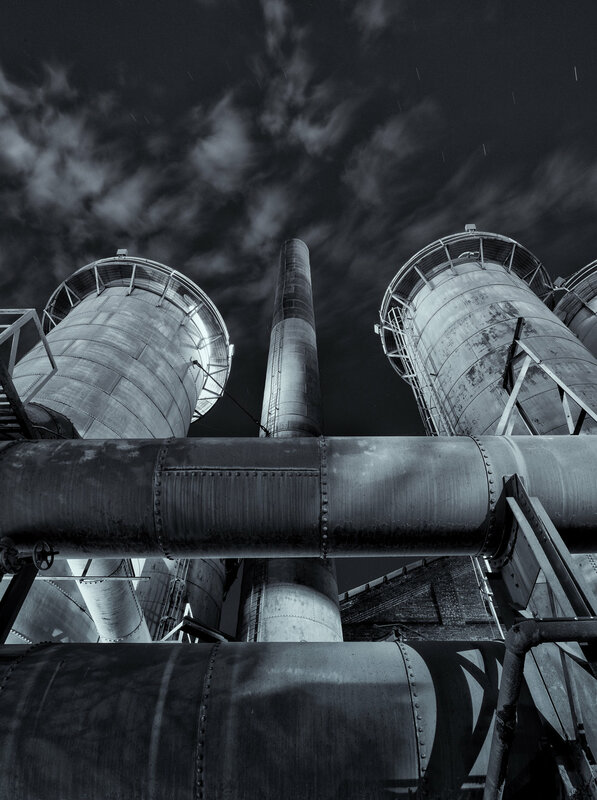 This 3-night, 4-day workshop grants us access to one of the most important and still intact historic industrial sites in the United States. 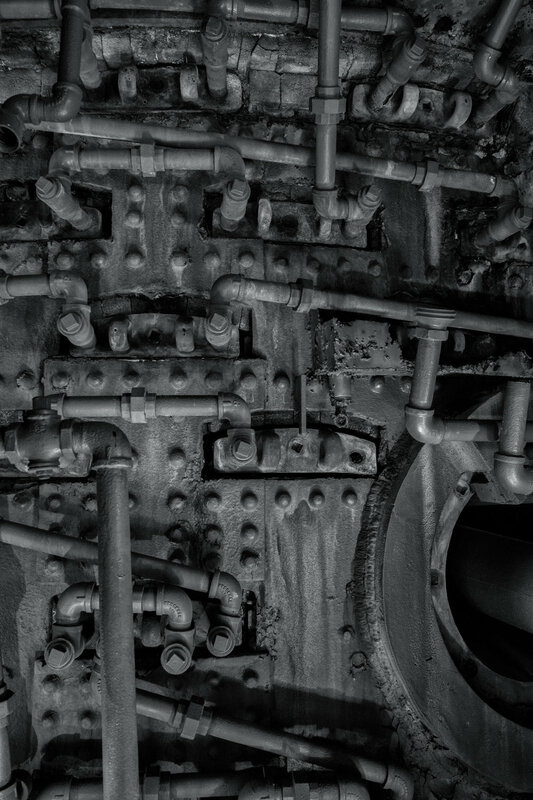 If you like turn-of-the-century industrial ruins, then you will love weaving your way through the web of pipes and smokestacks that fueled the Sloss Furnaces from 1882 to 1970. 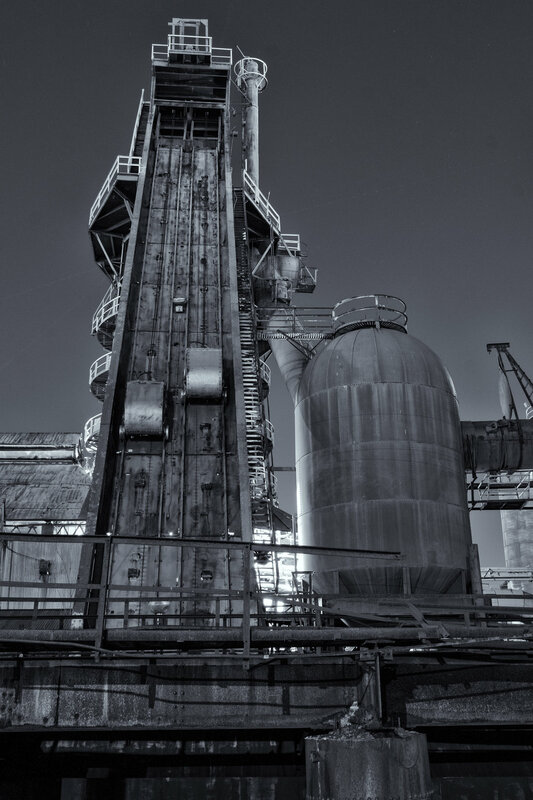 The Sloss Furnaces were known as the top producer of pig iron in the world. They brought the Industrial Revolution to the south and helped create Birmingham, otherwise known as the Magic City. The moon will be in its first quarter phase and will brighten the sky for our urban night shooting. We will be able to work outside the looming structures and challenge our compositional skills to capture the many intricate details, repeating patterns and sense of place. 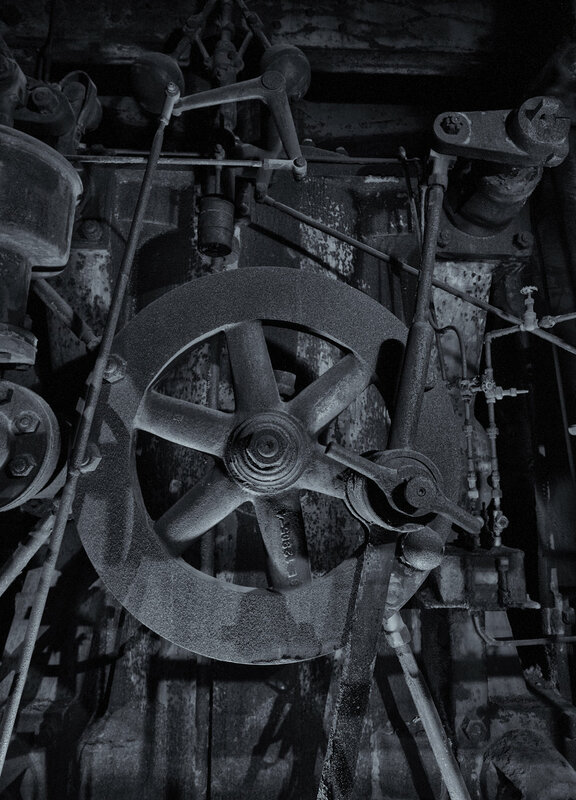 We’ll also be able to step inside the dark engine rooms and really work our light painting skills to reveal the many oversized gears, machines and tools of 20th century ironmaking technology. We scheduled this workshop in the winter so that we could avoid the heat of the South as well as start shooting in early evening. This is considered an intermediate workshop. Students should know their cameras well, and be comfortable shooting RAW in manual mode with a DSLR or high-end mirrorless camera. Some night photography experience is recommended. For advanced photographers, we can offer a portfolio review, specific challenges and goals, and will offer guidance in the field if you mainly want to concentrate on creating portfolio images or learning more advanced techniques. We hope to push you to step outside your comfort zone—to test the limits of what you and your camera can do. You’ll go home after the workshop with a solid grasp of composing and creating beautiful black and white images in complete darkness. This workshop will have both field and classroom instruction. We will be in the classroom each day, and out in the field at different locations each night until midnight. While in the field, the instructors will demonstrate their own techniques, and work with participants one-on-one to make sure everyone gets the most out of the workshop. During classroom sessions, there will be presentations by the instructors, but we will focus on developing your images and sharing everyone's work and ideas with each other. Each day will have a review of the previous night’s work. 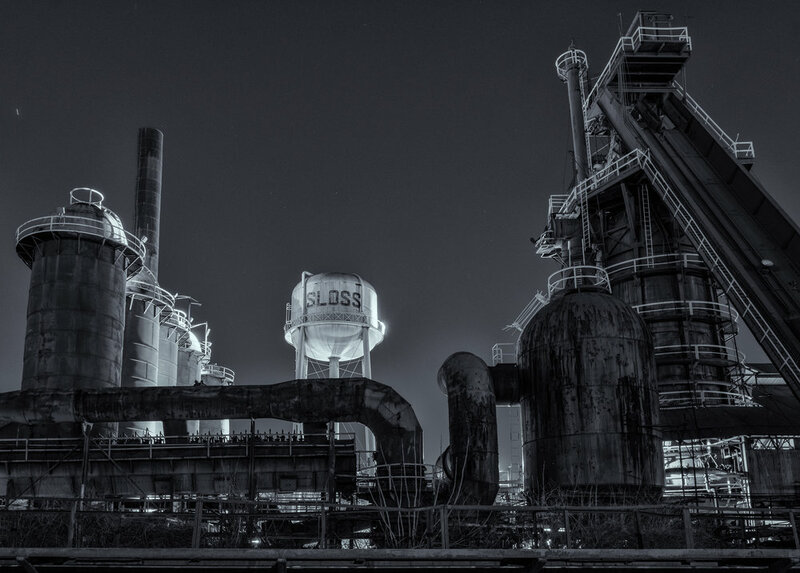 We are also very excited to be collaborating with the Sloss Furnaces and their theater to showcase your work as a group slideshow that will be open to the public on Sunday, November 18. You are responsible for your airfare and car rental. If you are interested in sharing a car rental, let us know and we will try to connect you with someone in the group. We wholeheartedly encourage carpooling! The workshop will be based at a hotel in Birmingham. You are not required to stay at the official workshop hotel, though doing so does make it easier to meet with the group each morning. Booking info and a group code will be sent after registering. You’ll definitely want to take advantage of the amazing southern food that can melt in your mouth in Birmingham! Because of our schedule—later mornings and late nights—we advise going on the two meal plan: late breakfast and early dinner. We will be arriving on location around 5 p.m. each day. When on the night shoots, you may wish to bring your dinner or snack food and PLENTY OF WATER. We chose November so that we can enjoy the South without the heat and humidity! November is a very mild month with an average temperature of 65 F during the day and 45 F at night. We could encounter some rain and clouds—but that should only bring additional drama to the scene! There are plenty of indoor locations to shoot to avoid getting wet. Recommended attire: We suggest bringing layers of clothing so that you can bundle up accordingly. 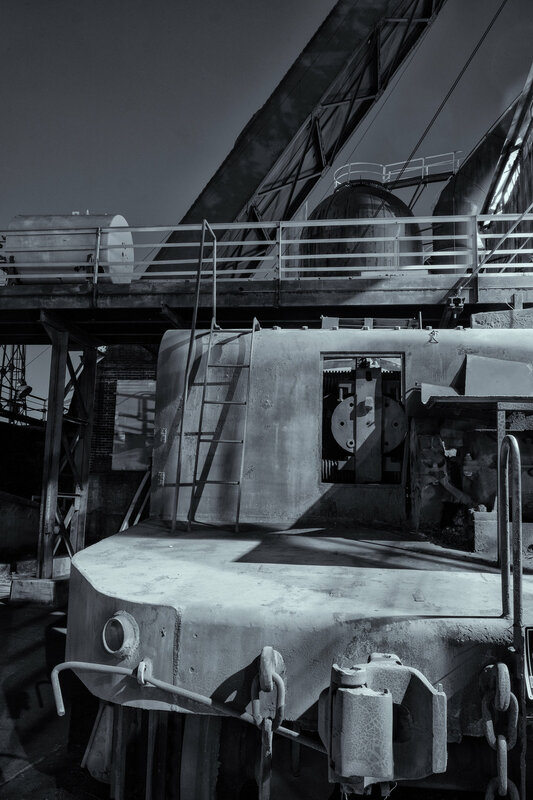 Comfortable and protective shoes are recommended for getting around Sloss Furnaces. I had very little on my agenda during my first visit to Birmingham. I knew there would be good comfort food to partake in and I wanted to visit the Civil Rights Institute. On my drive from the airport to downtown my head twisted in surprise as I passed the surreal site of an old steel mill in the heart of a city. I immediately started researching more about how the Sloss Furnaces kick-started the Industrial Revolution in the South and created the Magic City of Birmingham. I love modern ruins and spent the next two days ecstatically exploring the exquisitely preserved site. There weren’t many people there and I felt like I had the whole place to myself. 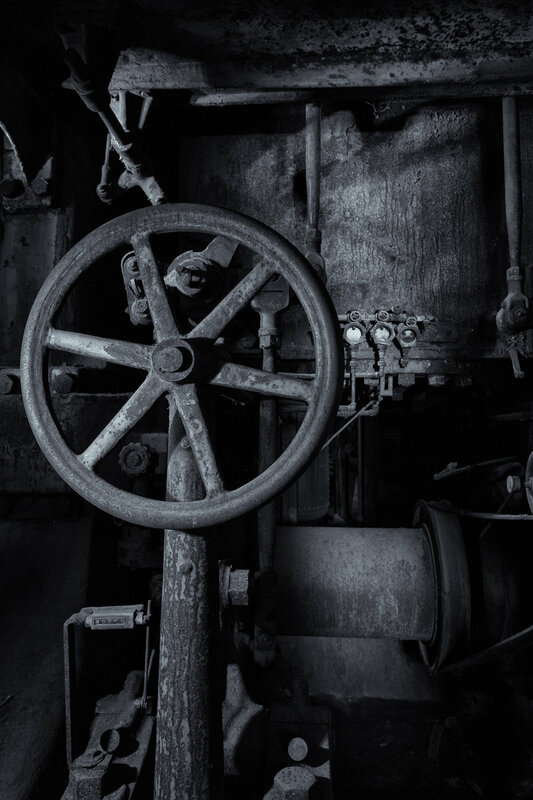 In true testament to the Industrial Revolution, all the machinery was huge and over-engineered—bolts the size of heads and steel wrenches larger than humans lay strategically placed in the engine room. To say that I was overwhelmed would definitely be an understatement. 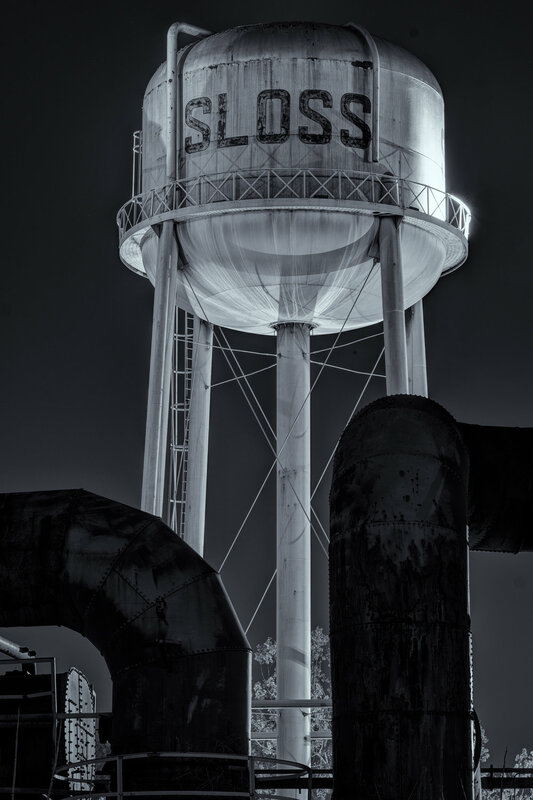 I knew I had to come back and photograph it at night. Unfortunately that took several years, but when it finally happened it was like visiting an old friend. The Sloss visitor center was a totally new and modern building that could justifiably showcase the history in photographs and artifacts. The sun started to set, several of the lights fired up and it was as if this factory was operational again. I punched in and went to work.